Dr. Marvin Bautista DC, San Bruno Chiropractor, Bautista Chiropractic Care, Inc.
Dr. Bautista is committed to providing excellent care to his patients and constantly strives to improve his techniques. By combining a multitude of adjusting techniques, stretching, myofascial therapies and exercise, Dr. Bautista finds the best combination of treatment for each patient with the goal of restoring optimal health. He strives to educate his patients about their own spine and body so they can be better informed and equipped to help themselves as well. 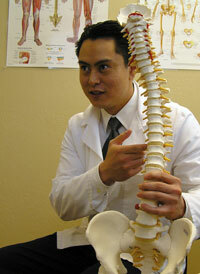 Dr. Bautista earned a Doctor of Chiropractic from Palmer College of Chiropractic West, and a Bachelor of Science in Biology from Santa Clara University. He has experience in personal injury and workers compensation cases. Born and raised in the San Francisco Bay Area, Dr. Bautista is excited to serve his community. His passion for health and love for humanity is what drives his high level of care and service to his patients.